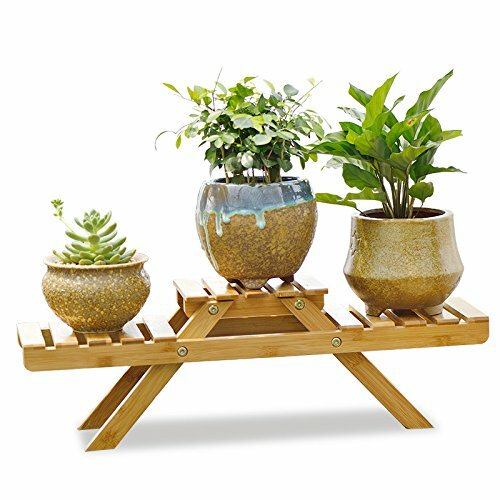 Bamboo products, sturdy & were easy to assemble, can not foldable, it has external dimensions of 20.8 " x 6.7 " x 5.9 " ,is compact enough for office desk and apartment balconies, perfect for displaying succulents potted and potted cacti or other small plants potted. not include pot and plant. It has external dimensions of 20.8 " x 6.7 " x 5.9 " and weighs 2 lbs (approx). Maximum weight capacity is 20 lbs per shelf. This 3-tier shelving system is compact enough for office desk and apartment balconies, perfect for displaying Flower Pots on desk or windowsill. A functional and decorative addition to your living room, balcony, courtyard or office. Suitable for succulents potted and potted cacti or other small plants potted. Bamboo products, sturdy & were easy to assemble,can not foldable, we will provide the instructions. If you have any questions about this product by ARTINHOME, contact us by completing and submitting the form below. If you are looking for a specif part number, please include it with your message.